MISSION, KS--(Marketwired - Nov 19, 2014) - (Family Features) Let the blustery winds blow while you stay warm inside and while away the wintry hours with cozy crafts that keep you warm. 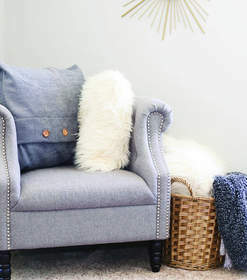 Start by updating your favorite reading chair or couch with comfy new pillows that invite you to grab a blanket and burrow in tight. Easy Envelope Pillow Covers, a project from the crafting experts at Jo-Ann Fabric and Craft Stores, combine velour and faux fur fabric for a great texture you can't wait to snuggle into. Once you're tucked in tight, chase the chill away with a mug filled with your favorite coffee, cocoa or cider. Sip in style with a DIY Scalloped Sharpie Mug. These pretty pieces also make great gifts, especially when filled with bite-size treats and wrapped with a shimmery ribbon. Or if you're planning on entertaining, make several in different colors to help your guests keep tabs on their own toasty beverages. For more wintry crafting ideas, visit www.joann.com. Basic Envelope Pillow Cover: Trim velour fabric to 25 inches by 54 inches with rotary cutter on mat. Fold over fabric on 25-inch ends and hem. Fold length of fabric onto itself, right sides together, and measure a 24-inch square. Pin to hold it together. Sew each open edge using a straight seam with 1/2-inch seam allowance. Remove pins and turn cover right side out. Using coordinating thread, sew buttons onto outside flap enclosure for added embellishment. Place cover over pillow insert. Faux Fur Envelope Pillow: 1. Repeat steps above, starting with faux fur fabric trimmed to 19 inches by 30 inches. Starting at the top of the mug, trace semi-circles with permanent marker in a scallop pattern, using the bottle cap as a guide. Repeat until you reach desired number of scalloped rows. Add dots to scallop pattern if desired. Use alcohol and cotton balls to dab away mistakes, if needed. Fill mug with candy. Wrap mug with clear cellophane gift wrap and gather open ends at top; secure with ribbon.